This salad is great on its own as a main meal. This has all the great flavours and proteins you need in a meal. Its simple delish !!! Serena Tuna cans ( serving depends on how many people eating, usually one can per person). Just put enough ingredients in each bowl to your liking. No need to toss or mix just serve or eat straightaway. 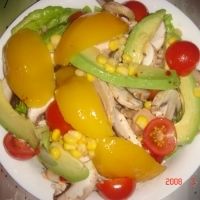 This Gourmet Tuna Avocado Mushroom And Mango Salad is fantastic .I remembered to ad some corn thank you. Like mrs_lau's recipes? Never miss an upload!